As a frequent Southwest passenger, paying for checked baggage is not quite commonplace for me yet, since Southwest is a firm proponent of bags flying free. As any traveler is well aware, many airlines now charge an additional fee for checking baggage, averaging roughly $20 per bag. However, I was initially surprised when I recently checked in online for my US Airways flight, and was offered the option to declare the number of bags I’d be checking and thus pay a reduced price of $5 less per bag. Although at first glance you might be tempted to think this is a classic example of price discrimination, further examination will reveal other possible explanations for this pricing disparity. If price discrimination were the sole justification for the two different prices, this would mean that US Airways is trying to extract additional consumer surplus (and thus increase profit) by segmenting the market into those who check in online and those who don’t. Based on the pricing differences, this would mean that US Airways believes that those passengers who check in online have a lower willingness to pay than those who check in at the airport. However, there is reason to believe that many passengers who check in online might actually have higher willingness-to-pays than other passengers, as they are likely to be business travelers who are either in an office with wifi or have internet connections on their phones. Since business travelers tend to have a more inelastic demand for travel services (mostly since they do not directly incur the expense), an argument could be made that this market segmentation isn’t the most profitable. Paying for bags ahead of time reduces the wait time for passengers seeking to check in at the airport. This makes customers happy and more willing to fly US Airways, and perhaps lessens the need for extra employees working the check-in booths. 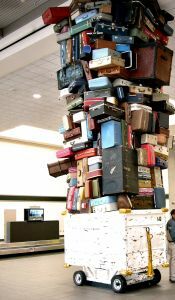 If passengers declare the number of bags they are checking ahead of time, US Airways can more accurately predict the number of bags that will be on the flight and perhaps the need for overhead space in the cabin. 1. If US Airways’s goal is to increase profits through price discrimination, is the market segmentation they are using appropriate? Can you think of any other existing ways that airlines segregate their markets? 2. How does this information friction about the price of checked bags affect efficiency in this market? 3. Can you think of other markets where different pricing mechanisms exist in order to incentivize a particular action, such as cities charging for trash removal but providing free recycling services?